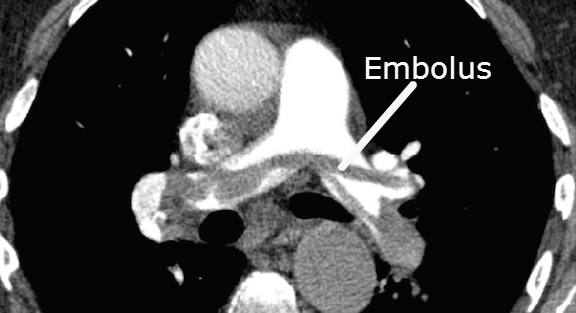 What is a pulmonary embolus? A pulmonary embolus (PE) occurs when part of a blood clot somewhere else in the body breaks off and travels to the lungs. The embolus could come from a deep vein thrombosis in the leg or the pelvis. The floating piece of clot blocks the blood supply to the lungs. A small pulmonary embolus may not cause any symptoms, but a large on can cause breathing difficulties, fainting spells and can even be fatal. How do I know if I have a PE? A pulmonary embolus can cause several different symptoms. The most common symptoms are shortness of breath and chest pain. These can come on quite suddenly. The chest pain is often described as a stabbing pain like a knife and is worse on taking a deep breath. The pain is caused by inflammation of the membrane covering the lungs. Some people have an irritating cough and may cough up a small amount of blood. Not all people have all of these symptoms.